This time of year always feels fabulous. The days are long and your enthusiasm for going out with friends and lovers seems limitless. The only hitch is coming up with enough outfits to match the dates in your calendar and the season’s rosé-tinted mood. Enter: flowy tops, metallic-detail dresses, dancing-queen jumpsuits, and high-shine accessories. Once these pieces hit your closet, you’ll begin to see a bit of real style magic: each item works just as well in the boardroom as it does on the dance floor. Just throw one of our many blazers over your dress in the morning and swap it out for some silver or gold heels at night. Go bold in a little white mini dress. This one boasts geometric details that visually sculpt your core. Put a new nighttime spin on stripes with lines that dot, dash, and follow your curves. Balance that bootylicious skirt with a soft flowing blouse in petal pink—tied your way. You only need a little bling to make a big impact. 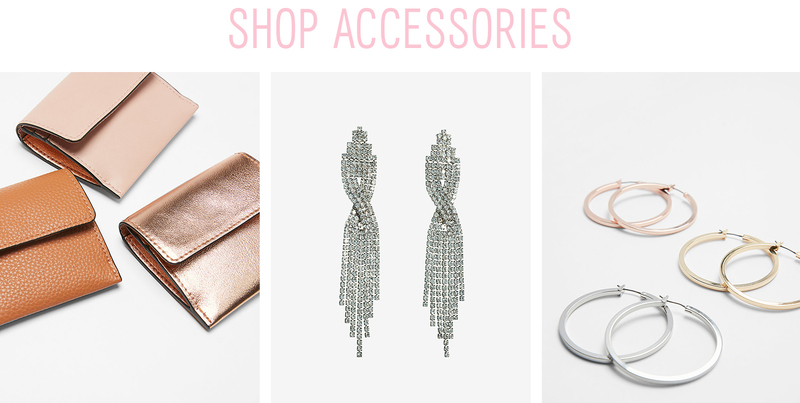 Molten or sparkly accessories will get you where you need to go.